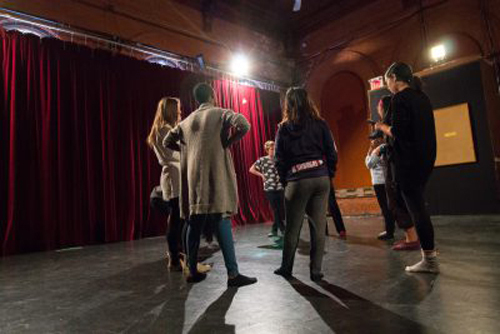 The AMY Project is a free arts education and mentoring program for young women and non-binary people, fostering leadership and confidence while encouraging their unique voices. For the 2016 SummerWorks Festival, the hard-working young people of the AMY Project present Quiet Revolution, the culmination of the AMY Spring Theatre Creation Project. Quiet Revolution is a show that blends spoken word and slam poetry with movement and songs, complete with guitar and choral arrangements. The beauty of the words in these monologues and manifestos is that they come straight from the young participants themselves. In fact, even the songs were written by the performers who possess some serious talent. This performance is filled with material that is vitally important for young people these days to hear — in particular, young women of colour, queer youth, and even those immigrating from another country working on acclimatizing to a new language and culture. This representation is strong within Quiet Revolution, which is incredibly necessary these days as this kind of representation isn’t usually seen in popular culture. Topics of loving your body and skin colour for the size and shade that it is, being queer in a very religious society, coming out of the closet, finding and creating your own representation when it appears that representation isn’t already there, finding self confidence when others consider you stupid for not knowing the language of a new country, and why Black Lives Matter really does matter, are just some of the many areas covered. This being only their second performance during this year’s festival, the performers had a bit of a stiff start where lines came out a bit awkwardly, but it didn’t take long before they all found their rhythms and fell comfortably into their roles. The songs and poems they delivered were weighty, powerful and meaningful. There was humor and attitude and profound relevance to their words and songs. The performers of The AMY Project along with directors Julia Hune-Brown and Gein Wong did tremendous work here. During the talk back after the show, a member of the audience said that this is a show that needs to be seen in schools, as it does speak to young women people on so many levels, as well as to the teachers who educate and mentor them. I wholeheartedly agree, and while it’s not certain whether or not Quiet Revolution will take to the road, there are still two shows left during SummerWorks. If you have a young woman or non-binary person in your life, take them to this show. Quiet Revolution plays at The Theatre Centre BMO Incubator (1115 Queen St W). Editors’ Note: This review has been edited to use gender-neutral language at the request of the producers.